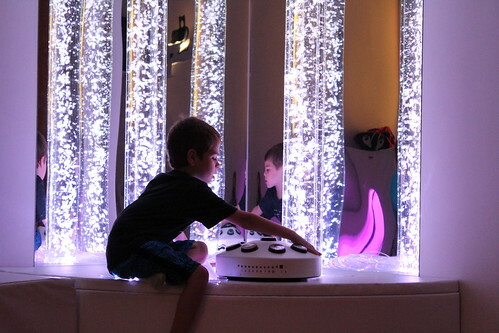 In 2014, SEASPAR built Wonders, the first Multi-Sensory Room within a municipal building in the country. Wonders is located at the Lisle Recreation Center – Door 8, at 1925 Ohio Street in Lisle. Wonders features interactive equipment that pleases the senses in a variety of unique and soothing ways. The Gesturetek Cube creates an interactive projection on the floor with amazing special effects which are gesture-controlled. The Soundbeam 5 converts movements into sound and music. Individuals are enabled to express themselves through this contact-free musical instrument. Bubble tubes provide multi-sensory feedback and stimulate the visual system. Individuals can control color changes and color change speed with the push of a button. The Vibroacoustic Learning Chair offers beanbag styling with mold-to-the-body comfort. Music is played through the chair so that the individual is surrounded by the music and can also feel its gentle vibrations. Sparkle and marble walls let individuals control colors and lights with the touch of their hands, and feel the calming coolness of glittering glass. Essential aromatherapy oils can be diffused into the room, dispersing a calming and pleasant scent. Several items are also available for individuals to move around the room as they please. Examples include the Jumbo Love Bug, aromatic stuffed animals, weighted blankets, and more. Watch this video for a quick peek into Wonders! Browse photos of Wonders in the gallery below, or view the photos on Flickr! Visiting Wonders requires registration through SEASPAR. Weekly programs, special events, and adapted programs are offered at the site. View our current season’s program guide on the Program Schedules and Brochures page to learn about program offerings. Our Sensory Sunday program allows participants ages 3 and older to experience Wonders on flexible dates with a 5- or 12-visit punch card. Call us at 630.960.7600 for more information. We also partner with Child and Family Connections to offer playgroups to families of children with a disability, ages birth to three years, at Wonders. The goal of the playgroup is to bring families together in an open format, to play with other children, and to meet other parents with similar experiences. Siblings are encouraged to attend. The group meets the second Tuesday of the month from 9:30-11 a.m. For more information, call Jenny Somone with Child and Family Connections at 331.481.4257. If you would like to schedule a tour before registering for a program, please call us at 630.960.7600. A waiting room is adjacent to Wonders, with a one-way viewing window for parents if they choose to observe. Complimentary Wi-Fi and coffee are provided. For more information about the Wonders Multi-Sensory Room, please contact us online or call us at 630.960.7600. Download the Wonders brochure.Clicking this link will open a PDF document. The Wonders Multi-Sensory Room is an excellent field trip destination for students, with additional activities available. If you would like to schedule a visit for a field trip, please complete the Wonders Multi-Sensory Room Field Trip Request Form online. For more information, call us at 630.960.7600.